The Brighton Beach quilt block is a five patch block (meaning it is created using a 5 x 5 grid). However, rather than sew the block in five rows of five, I prefer to construct is as an uneven nine patch as I find that an easier method. This is am easy block and is a good choice for beginners. 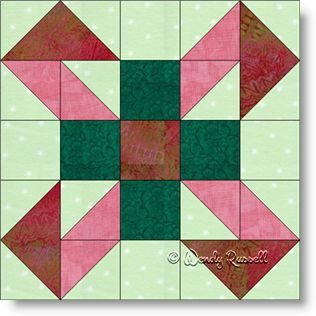 You will learn about making half square triangles and flying geese - two of the most commonly used patches in quilt making. The sample quilts illustrated give you ideas of setting your quilt blocks side by side (which produces a subtle secondary pattern of pinwheels), or I have also chosen to set the blocks on point with sashing strips and blank blocks to showcase your quilting skills.